Does My Dog Really Need a Distemper or Parvo Vaccine? The canine distemper virus is common in raccoons, skunks, foxes and coyotes. How many of you have these visitors in your yard? Almost everybody that lives in southern California has. The Los Angeles Public Health department reports about 58-150 annual cases of raccoons showing signs of distemper. In 2017, there was an outbreak of distemper in raccoons in Redondo Beach and Wilmington. And who is the most likely family member to chase or get close to these visitors? Yes, the dog! 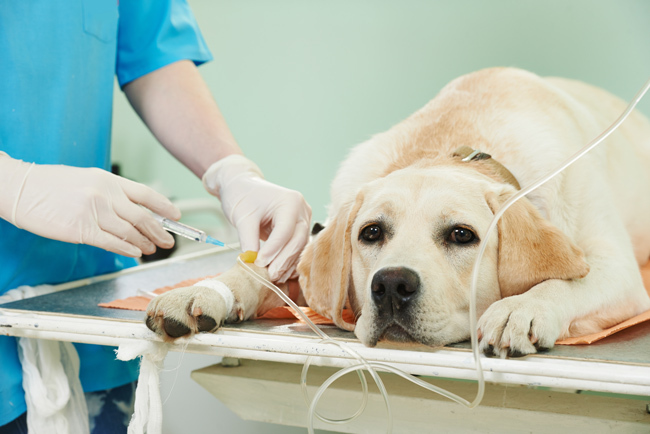 Often these encounters are a night and you are unable to tell if there was contact with contagious nasal or eye discharges or ingestion of contaminated vomit or feces from infected animals by your dog. Raccoons, skunks, foxes and coyotes can also spread canine parvovirus. Since wildlife along with unvaccinated dogs pose a health risk to your dog, a wellness plan should include protection against distemper and parvo viruses. But does that mean vaccinating yearly? No. Dogs are protected for at least 3 years after vaccination. Some dogs carry antibodies against these viruses for longer periods. June is Vaccine Awareness Month. We are offering 10% off all vaccine titers! Want more useful health information about your dog? Sign-up for our newsletter.